ICWA tells a single unmarried woman who wishes to choose adoptive parents for her unborn child—a choice that would be respected under her State’s laws—that she must either terminate her pregnancy, raise the child herself, or surrender her child to a Tribe that is a total stranger to her and to the unborn child. 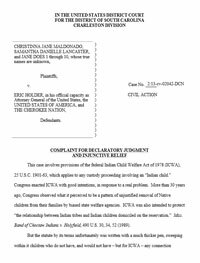 Even if Congress is empowered to enact legislation respecting child custody matters involving children whose parents are domiciled on tribal lands, Congress may not override a woman’s deeply personal decision to place her child with a loving and fit adoptive family, and impose special disabilities on that child, in the name of tribal sovereignty. See the complaint at the Turtle Talk website. This entry was posted in Court Cases, News and tagged South Carolina, Veronica. Bookmark the permalink.